Today you take a look at our custom made wedding stationary. The invitations, RSVP cards and table numbers (not pictured) were created by my very amazing graphic artist, who truly nailed it. They came out exactly how I wanted them, naturally I had picked an idea that would reflect the theme of our wedding, a secret garden, romantic and whimsical theme. I was so in love with them that I just couldn't take my eyes of them. My MOH and her husband own a print shop so she had them printed for me on a beautiful shiny paper called Stardream in Quartz, it gave them an extra but subtle touch. I was so lucky that my best friend and her husband printed the invitations, RSVP cards and table numbers for me, that was a blessing as it saved us a lot of cash. Not to mention that she also had them arranged and sent out to all of our guests and collected all of our RSVP cards, so thankful for having her as my little helper because planning from afar was no easy task. 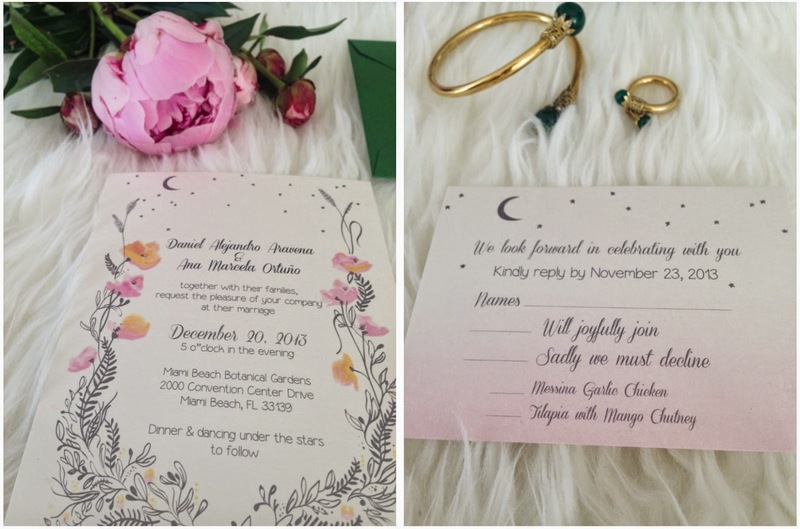 To give our invitations a more vintage and romantic look, we sealed them with a rose shaped wax seal stamp and gold wax. They will keep you adrift, as far as they come. Is that euphoric memory of thy time in the sky. Labels: LCI Paper, Miami Beach Botanical Garden wedding, Nostalgic Impressions Wax seal stamp, Post-Wedding Week Series, Save On Crafts Gold Wax seal, Shutterfly Thank You Cards, Wendy X. Ordonez H.